The back of the case has about an inch of cable management space. This is not a lot, but certainly enough to route a few cables. The design of the back tapers in the bottom allowing for more space towards that part of the case. The bottom part of the back has about 1.5″ of space. That is enough space to allow you to mount a SSD, or connect cable extensions without worrying about a place to hide them. For those wondering how much space they have for water cooling gear….. There is about 2.5″ of room from the bottom of the top fan mount to the top of the board. Keep in mind that you have room under the top panel for installing fans (25mm thick), that does allow you to install a 60mm thick 360 radiator in the top. Fitting a thick 420mm radiator will cause issues with the 8 pin EPS power connector. For those wanting to know how much space is available for board and memory clearance when using thicker rads. With a 140mm fan mounted in the case, you can see that there is only .75″ of room from the back of the motherboard tray to the 140mm fan mount. That is not enough space to install a radiator that is too thick, as it will interfere with the 8 pin EPS power connector, board heat sinks, and the memory. Just like a lot other Phanteks cases, the Luxe comes with a nice accessory box. A very nicely printed, and detailed manual is included with the case as well. It wouldn’t be a Phanteks case, if it did not come with a nice little plastic container with an assortment of screws. Sometimes I wish that Phanteks would sell these containers with the screws separately, as you could use them for a lot of things. The accessory box also contains some zip ties, and a couple extra Phanteks Velcro cable routing straps. For those who need a pump mounting option, Phanteks includes their anti-vibration pump mounting bracket. It works perfectly for mounting all of the popular water cooling pumps out there. The case also comes with a nice universal reservoir bracket, that can be used for mounting tube reservoirs. The reservoir mounting bracket mounts to the bottom of the 5.25″ bays, with a little support bar in the middle of the case. The installation is pretty easy, and it can be used as long as your GPUs don’t come in the way (most Strix owners are out of luck here). The front of the case has couple Drop N Lock SSD mounts, and the case comes with Two (2) trays that allow you to install SSDs in the front, and show them off. There is also a nice metal Phanteks logo plaque mounted in the bottom of the case. Wonder how long before that gets RGBed….. Given my choice of hardware, a bay reservoir was a perfect option for my build. Having Three (3) 5.25″ bays is great for those who want to use a bay reservoir. You can also use the extra bay for a fan controller, or some kind of spinning disc reading apparatus (optical drives). Using hardware at hand, I put together the above build. Just like almost every other Phanteks case, there is a lot of attention paid to designing a case that’s easy to work with. The proportions of the case are perfect for almost every type of build. The Strix GTX 1070 GPUs pictured above are some of the longest 10 series cards on the market right now. The included tube reservoir mount would have worked perfect if I had used the reference PCB GPUs, or cards that are shorter in length. 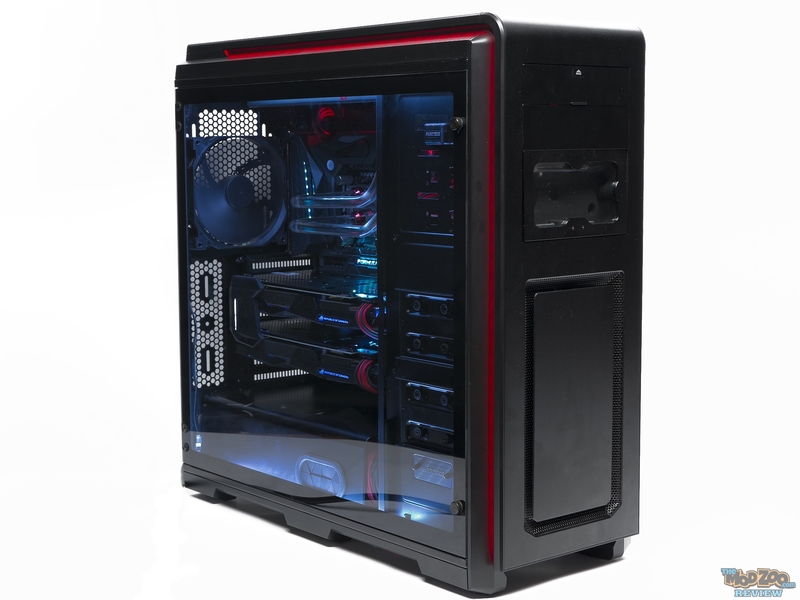 The RGB accent lighting included in the case works great, and allows for creating a nice look for any build. For this build I used hardware that has no other color than black, but, has built in RGB. This way I was able to create a look that was perfectly matched to whatever I wanted, and was perfect way of adding more class to the build. The beauty of tempered glass is the clarity! Unlike having an acrylic panel that attracts dust and scratches easily. TG is great for a build where you are using hardware that you want to show off to the world (and most importantly YOU). I like the fact that Phanteks includes all Black fans (no White blades) as they are easy to blend into a build, and don’t look out of place. Podcast 26: Do They Have A Safeword?